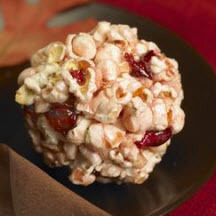 A sweet cranberry orange relish syrup is the binder for these autumn-festive candied popcorn balls. Combine all ingredients, except popcorn, in a heavy saucepan. Bring to a boil; lower heat and cook to 250°F (120°C) on a candy thermometer. Mixture will bubble up in pan, so watch to keep from boiling over. Pour slowly onto hot popcorn and mix until well-coated. Let stand 5 minutes or until mixture can easily be formed into balls. Butter hands and form into 3-inch balls. Cool. When cooled, wrap each popcorn ball individually in plastic wrap or for a festive touch, in cellophane and decorate, if desired, with ribbon or raffia.